If you love nature, then you’ll love Bulgaria. Explore breathtaking mountain panoramas, green valleys, and more outdoor sports than you can imagine – from snowboarding to trekking, fishing and horse riding! Join me on a green tour of Bulgaria, and experience the natural beauty of my country. All of my tours are custom designed, to suit the interests and capabilities of your group. You can customise pick-up points, finish locations, and everything in between! My custom tours of Bulgaria combine rich local knowledge, with years of professional experience. Let me show you the best this country has to offer! You’ll be met with a comfortable, air-conditioned tour bus – and by using dedicated, professional drivers, I’ll always be free to tell you more about Bulgaria along the way. I’ll be very happy to work to your budget – my tours are competitively priced, and I can always tailor itineraries to meet your ideal price. I can organize guided green tours around Bulgaria as well as self-guided green adventures if you want to discover the beauty of the country on your own. Traditional villages, clean and delicious food, mountains, rivers, rock formations, amazingly beautiful sea cost with crystal clear water and fresh air. This is Bulgaria! Let me help you to discover it on the best way. Read enough? Then send me a message! Let’s start planning your unforgettable green tour of Bulgaria today. Bulgarian beaches are world famous. The Black Sea coast is dotted with towns and villages, small and large beaches, pristine patches and spans with modern conveniences of all kinds, so all visitors can find the beach to their taste. Starting with the beaches of the large towns on the sea, Varna and Bourgas, covered with golden sand, the famed Sunny Beach, Sunny Day, Saints Constantine and Elena near Varna, and Sunny Beach near Bourgas. The aqua parks in Golden Sands and in Sunny Beach attract on hot days with water coolness. Fans of aquatic sports can practice not only swimming and boating, but surfing, surfboarding. Fishing fans are also on auspicious grounds. The mountains also offer diversity, from the lower Strandzha in the southeast, to the verdant Rhodopes, Rila with its diversity of lakes and brooks amid pine forests, the welcoming but also challenging Balkan Range crossing the country’s middle, and the majestic Pirin, a mountain and a nature park in one. In Rila, the most visited locality is that of the Seven Lakes, unique with the group of lakes at different altitudes. The valley of the Ivan Vazov mountain lodge is another favorite area, called the Great Rila Desert, fringed by ridges and inviting with the lodge where tea and yoghurt sampling are unique experiences. From the lodge it is a short trek to the Kalin Dam, the highest located dam in the country. In Pirin, trekking from a lodge to the other one takes a whole day, but it is a delight because the daunting peaks and the picturesque valleys, replete with herbs, forest berries, and majestic trees make time fly imperceptibly. The lakes and rivers are not as many as in Rila, but are no less beautiful. Strandzha is a mountain offering unique flower species which bloom in the beginning of summer, welcoming villages where finding board and lodging is easy, and everyone immerses into the Bulgarian Strandzha village lifestyle. Those who choose the Balkan range will find a number of reserves, like the Kozya Stena, the Steneto, lodges and beautiful forests, glades, plenty of berries, herbs, and crisp air. Sredna Gora, to the south of the Balkan range, is another must to explore, with its range of lodges and sights, comprising the Koprivshtitsa town reserve with old style houses and cobbled streets. Touring the historical sights is another must. In the Rhodopes, Perperikon is a much visited Thracian sanctuary. It is near Kurdzhali, a town boasting the so called Water Mirror, a large dam which offers freshness, opportunities for water sports, etc. A Thracian tomb, a UNESCO Heritage site, is the tomb in Sveshtari, near Isperih, in northeast Bulgaria. In the Rose Valley, in Kazanlak, there is another Thracian tomb. Near Sofia, the Boyana Church is another UNESCO site, a medieval church in two stories, with murals from diverse periods. Rila Monastery, huddled in the folds of the Rila mountain, is replete with history, and a UNESCO site. It dates from the 10th century and has been the stronghold for Bulgarian culture and national identity. Its frescos and architecture contribute to the reasons for its fame. 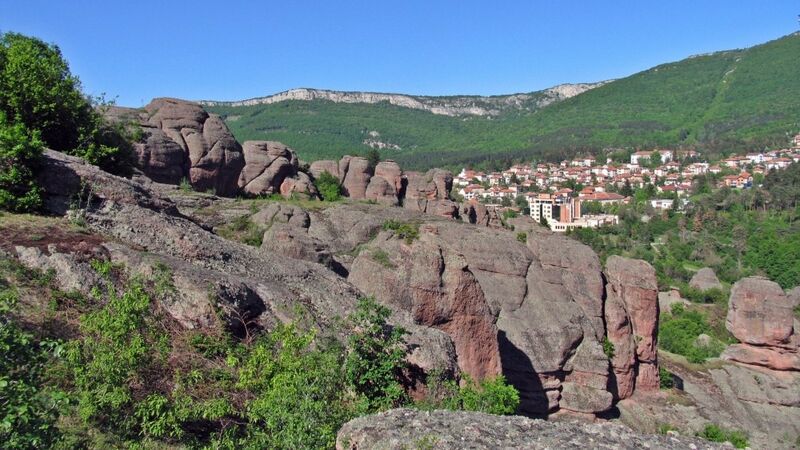 Rock formations and rock hewn monuments comprise another area to explore in Bulgaria. The doubtless favorite is the Madara Rider, a carving into the rock near the Madara village, a UNESCO Heritage site representing a rider and a dog behind the horse. The Madara area was the prime sacred place before Bulgaria’s conversion to Christianity. Near the Danube, in the vicinity of Ivanovo, a village near Rousse, the complex of rock hewn churches is yet another UNESCO site dating from the twelfth century, with cells, churches, and ancient murals. 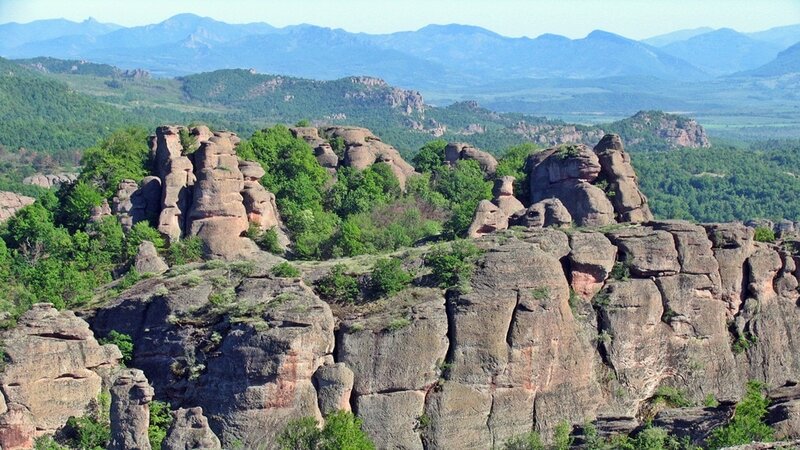 In the northwest, near Belogradchik, the Belogradchik Rocks represent unique formations in three groups, rising to 200 meters, with colors varying from red to yellow. Near Varna, the so called Petrified Forest is a rock formation complex on a former ancient sea bottom site. On the other end, near the southwest town of Melnik, the Melnik Pyramids impress with shapes of mushrooms, needles, cones, etc. Nature reserves form a string which boasts pearls like the Sreburna Lake, by the Danube, the largest lake by a river for the country. It is a UNESCO site, a biosphere reserve, meriting attention for its abundance of rare bird species, 221 species in number. The whole Pirin mountain also belongs to the list of nature reserves listed with UNESCO.